in Down Beat magazine (February 2010)! An ex-New Yorker's post-9/11 meditation on the good and bad around us all, the gorgeous suite Heaven and Hell is a roaring-yet-tender new work for tentet by brilliant French hornist/composer Tom Varner — featuring master trumpeter Russ Johnson and a cast of Seattle's top players. "Heaven and Hell," Tom continues, "is a 'looking back' at an almost-eight-year process of thinking about, composing, organizing, and executing the music, during a time of huge changes in the world and personally, as well, for many folks." It's filled with, what Tom describes as, "the 'combo platter' in life that seems to grow stronger the older we get — the good and the bad that is all around us," from "The Daily Dance," which reminds Tom of "the morning scramble of getting kids to school," to the snapshot of "new parents at 3 AM" that is "Waltz for the Proud Tired Worriers," which Tom feels is the most heaven-like, to the bleak, twisted, smouldering "Structure Down," which is "the most 'hell'" to Tom's ears. The sections of the entire Heaven and Hell suite, which form a dramatic arc, are tied together with short, improvisational interludes that Tom describes as interludes as "'quiet reflections,' bits of staring into space, between more heavy events." He goes on to say, "I also think of the whole piece rather cinematically, with lots of jump-cuts from different moments in time, often from a reflective present to a turbulent past. 'The Trilling Clouds' signals a heightened awareness, and the final 'Postlude: Nine Years Later' is a kind of 'sigh from the future.'" 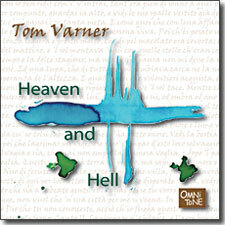 Buy Heaven and Hell now at the OmniTone store. All compositions by Tom Varner, Tom Varner Music (BMI). Recorded on 13-14 April 2008 at Jack Straw Studios in Seattle, Washington. Special thanks to Earshot Jazz, the Seattle Art Museum, the MacDowell Colony, the Blue Mountain Center, and the incredible musicians on this recording. An extra-special thanks to OmniTone's hard-working Frank Tafuri and Terry Wojtkunski, to Jack and Hope Varner, and most of all to the beautiful, wise, witty, and patient Terri Constant.